By Meredith Chilson on January 18, 2013 Visit Meredith's Website. 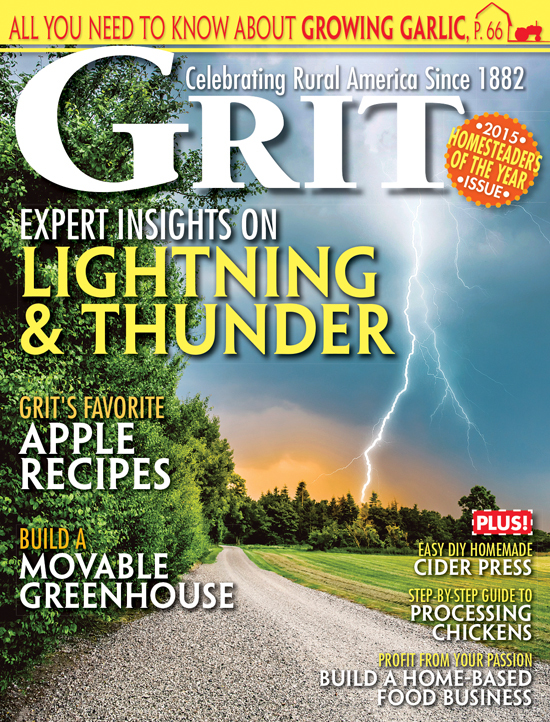 By Meredith ChilsonThis is the time of year that hatchery catalogs arrive, and just like the seed and garden catalogs that also clog our mailboxes, these “wish books” become well-thumbed, with corners turned down and photos circled. At least, that’s the way it is at my house. I pore over the glossy pages, dreaming of fuzzy chicks and spring. A few winters ago, I ordered my first chicks from a local hardware. I had three choices: Rhode Island Red, White Leghorn, or Buff Orpington. I knew I wanted brown egg layers, so a dozen Rhodies and a dozen Buff Orpingtons came to live at my house. They were good choices for a novice. They were friendly, heavy hens that laid an astounding amount of eggs and could withstand our cold winters well, and so began what is now our “family flock”. 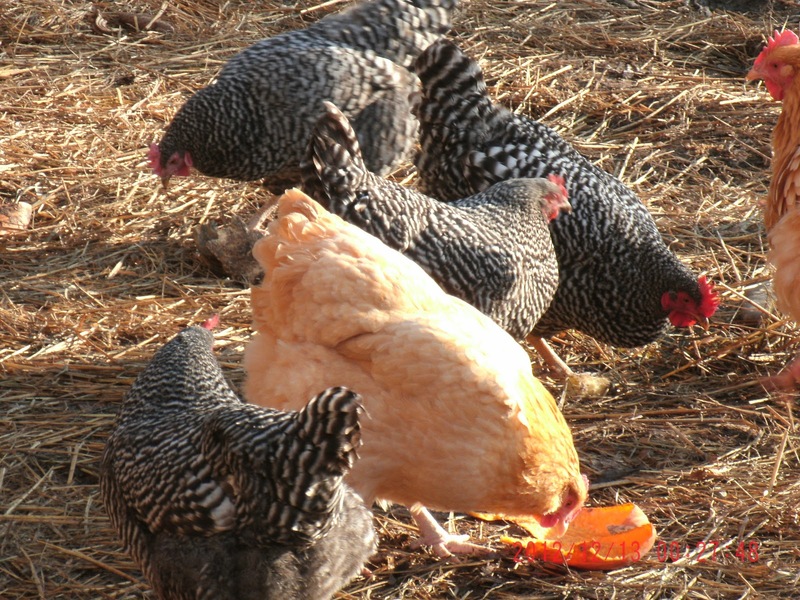 These breeds forage well when free ranging and head back to the coop when night begins to fall. If I want them to go in earlier, they are easily herded into the run. At least two of the Buff Orpingtons have become broody, and I’m glad to know that instinct has not been bred out of them, although I haven’t always let them raise chicks. I still have several of these “original” hens, and they continue to lay eggs, although not nearly as many or as often. Assorted colors and breeds that make up my flock. 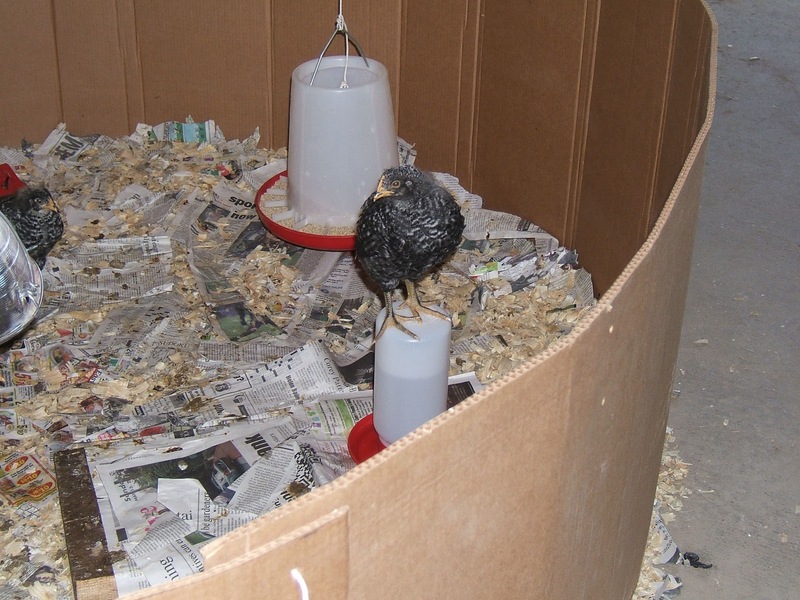 I’ve added other breeds to the flock—a black Silkie and a Poppyseed chick one year. The Poppyseed is a breed a neighbor was trying to develop, and the Silkie—I couldn’t resist! These two have distinct personalities and so have added color to the flock in more than one way! We added three more hens to our flock as a result of our amorous Buff Orpington rooster. One of the Buff hens sat on the nest, but I’m quite sure at least one of those chicks had a Rhode Island Red for a mother. 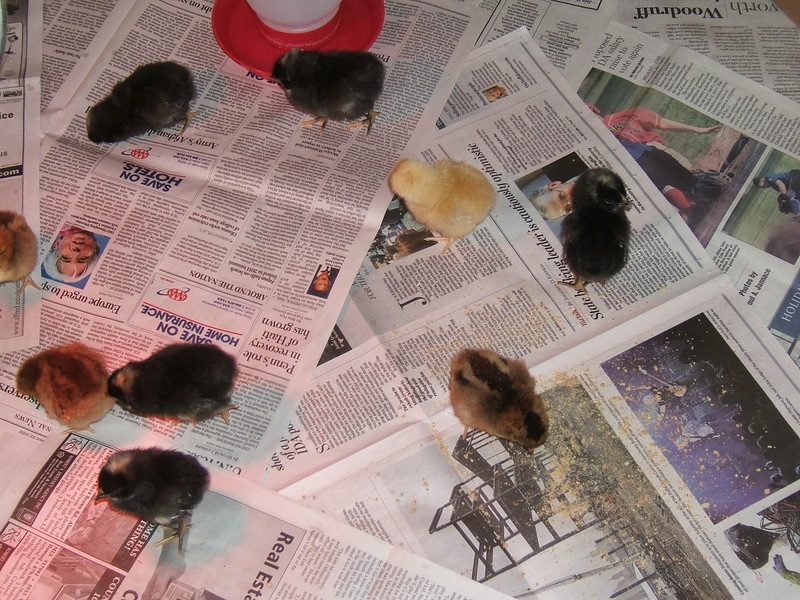 Last year, I fell under the spell of the hatchery catalog and ordered a dozen pullet chicks. Again, I wanted brown egg layers, but in the spirit of adding even more color, I chose Speckled Sussex and Barred Plymouth Rock for breeds. I’ve written about the Sussex, but I’ve not quite been sure how to talk about the Barred Rocks. I’ll start by saying they are beautiful. Every one of our Barred Rock ladies is just lovely. I chose them for several reasons: they were described in the Meyer Hatchery catalog as being very friendly, doing well in cold weather, and having “good hardiness [in] all characteristics that would be a great addition to your flock!” There’s some nostalgia involved, too, I must confess. I remember these black and white birds from an elderly neighbor’s flock years ago. In my mind, I still can see them pecking around the yard and curiously peering in the garage when I stopped to buy eggs. Finally, I was hooked with the pictures of the chicks—little black balls of fluff with a tiny yellow spot on their heads. I do love history. And farms. Combine those two loves with friendly, brown-egg laying chickens and with no further ado, my order was sent. Those balls of fluff were just as advertised. I noticed from the beginning—and remember, I pull my chair right up to the chickie pen and observe those babies a LOT—the barred Rocks (five of them) stayed together as a group. They poked around the pen (the Sussex raced), snooping into interesting looking areas, calling to their sisters when they found an odd colored flake of shaving or a particularly fascinating crumb. One of the black chicks seemed to take the lead, to be a bit braver than the others. She was the first to try new things, the earliest to hop onto the waterer to peer out into the Wide World Beyond the Pen. We named her Henrietta, and her group of “YaYa Sisters” followed along close behind. These days, Henrietta and the YaYa’s are full-fledged laying hens. (Did I mention that they are really beautiful?) At almost exactly five months of age, I noticed them checking out the nest boxes. A day or so later, Henrietta performed an excellent “squat” as I entered the morning coop, and it was not more than a week later we were finding nice, light brown eggs in the nests. I’ve found these hardy birds pecking through light snowfall, searching for treats. Their single combs are bright red now, signifying a healthy layer, and the combination of black and white feathers and red comb against the backdrop of a snowy day is…well, just beautiful. I don’t have favorites in my flock, I truly don’t. The Buff Orpingtons with their pleasant attitudes and sturdy bodies remind me of firmly corseted matrons. They fulfill their laying duties in a matter of fact manner, just as the ladies they appear to be. I think of my Rhode Island Reds as the “backbone” of the flock. They are companionable and good layers. I don’t notice them as much as some of the others, because they quietly and politely wait their turns at the feeders and roosts—no pushing, shoving or squawking. 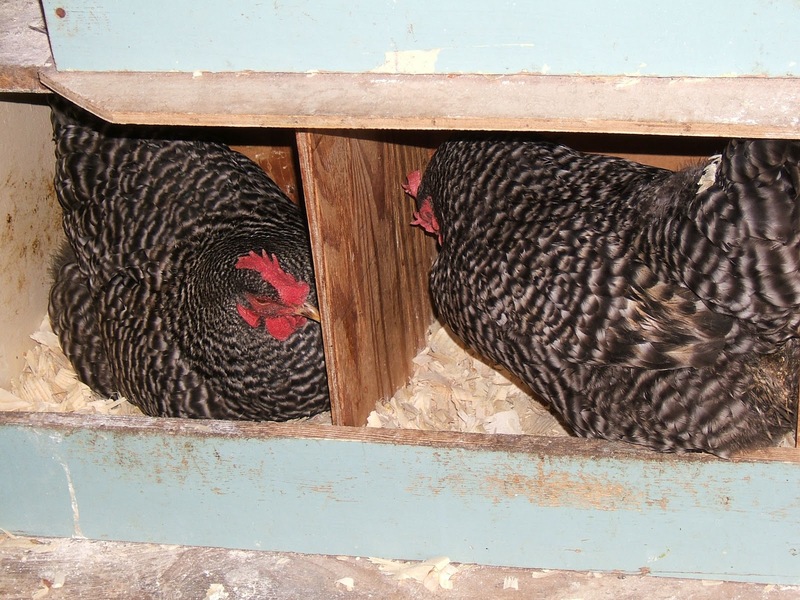 They are distinct personalities—from Mavis, the hen who insists on sleeping by herself tucked in a corner or a nest box, to Gracie, the hen that can’t quite figure out the rhythm to pecking at the seed cake. 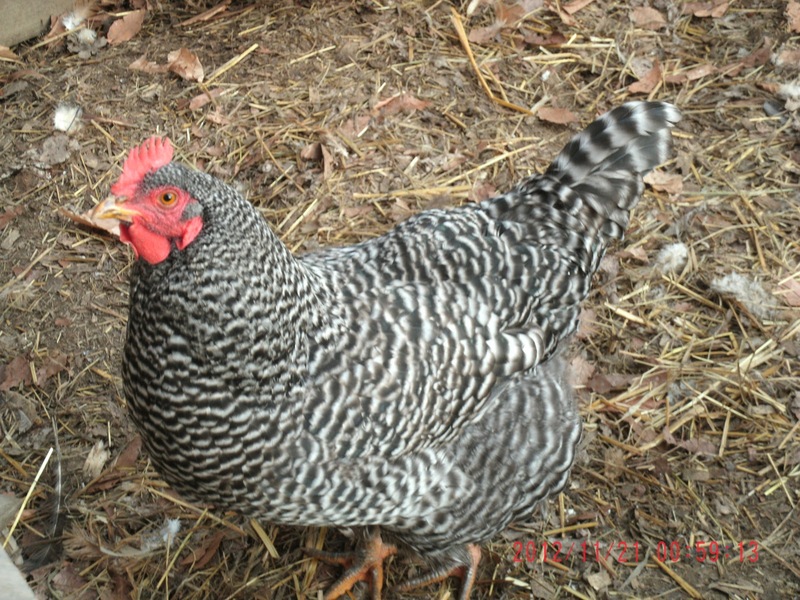 If I was asked which breed of chicken I would recommend to a beginning hen-keeper, though, I believe it would be the Barred Plymouth Rock. As advertised, they are docile, very cold hardy, and produce large brown eggs well whether in confinement or free ranging. And—they are beautiful! Read more about what happens in our valley over at Green Circle Grove –on Facebook, too. Two of our 18 chickie babies are Barred Rocks. They are a little younger than the rest and ADORABLE. I love the look of the full grown hens and look forward to seeing them strut in their fancy black and white suits. Thanks for all the info! I noticed newspaper on the floor in one picture. Be careful using newspaper as chicks can straddle (mostly heavy breeds) This is condition where they do the splits on one paper, A straddled chick is a dead chick. I use shredded newspaper works great. Shredded paper is easy to clean up and will go in the garden as mulch. Yes, they are dears as well. Ours (four, acquired together as pullets) have sweet dispositions and each are producing an egg a day, even in our cold weather. Their coop is cozy, having a plastic covered heating pad under the straw of their sleeping area and an infrared lamp “downstairs”. I wrapped the coop with 6 mil plastic sheeting, leaving the 3″ raised floor open for ventilation and keep a thermometer in the sleeping area. When I open the coop in the early mornings I find the coop temperature between 40° and 50°, even when we have near single digit temperatures outside. They have a fairly large pen to run in, a converted dog kennel 10′ X 16′, but when the weather warms they will be allowed to return to their free ranging. Right now we have way too many hungry critters roaming about but when Spring comes their threat will lessen significantly. We got them as our first collective experience with chickens as my wife has had them in the past. I have signed on as Chief Chicken Wrangler and really enjoy these sweeties. They love grapes and will sit on my head, shoulders and lap when I sit with a grape bag in hand begging for their treats. You realize, don’t you, that part of the reason they are such sweeties is all the TLC you are giving them? Part of the reason, maybe, but I certainly do agree that they are dears. Sounds like you have a great system worked out for them this winter, so they will be warm and safe while waiting for spring and green grass! 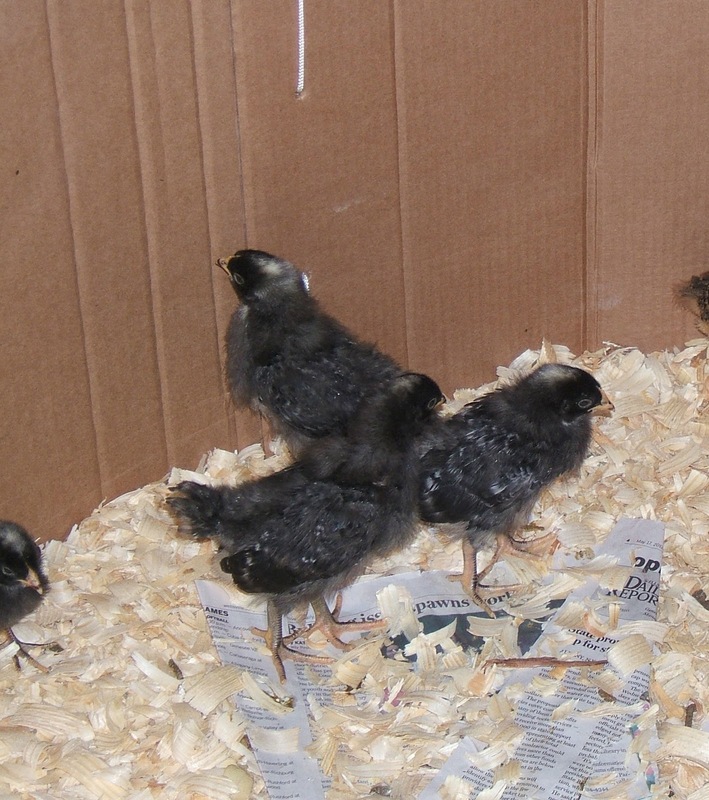 I have 2 Plymouth barred rocks & 4 buff orpingtons. I have been raising them since they were a day old. I got them last May. I just love them. I wish I would have gotten more barred rocks. They are so sweet. In the sunlight, the black in their coloring almost looks like a green color. I just love my girls. 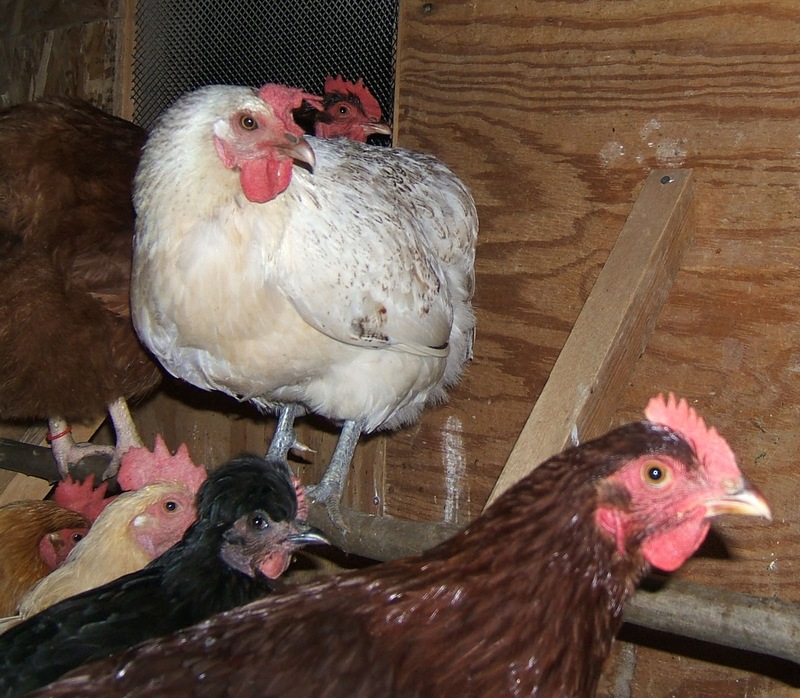 My first group of chickens I adopted were 5 Barred Rocks & 5 Cuckoo Marans. Those babies stole my heart. I only have 3 of my original Barred Rocks left, but they are my “Old ladies”:) They will be 2 years old in March and while they do not lay as much anymore, they are still my girls and will continue to live a rich life at my home. Oh good! I always think when they’ve put in their time and effort laying eggs, it’s my responsibility to give them a happy retirement. I bought some barred rocks at the insistence of my husband’s 89 year old aunt who had them here on her home place when she was a child. They are the most aggressive of my hens, the first out the door when I open the coop in the morning and run the furthest from it hunting bugs. They also must be the most active in the coop as they are the only ones with totally bare backs. Being half naked doesn’t slow down their desire to get fresh air in the middle of the winter though. I love them. That’s great–I just have such vivid memories of those Barred Rocks that my neighbor had. They were such snoops. Thanks for sharing that story.